Premier Doug Ford’s decision to reduce the number of councillors on Toronto City Council from 47 to 25 resulted in some very disparate new wards. New Ward 6, York Centre, combined two very different wards. On the west side of Allen Road, in old Ward 9, there are large Black and Italian communities, while on the east side of Allen Road, in old Ward 10, the population is largely Jewish, Filipino, and Russian. James Pasternak represented Ward 10. Previously a TDSB trustee, Pasternak was first elected in 2010 after incumbent councillor Mike Feldman retired. A conservative, Pasternak is best known for supporting a western extension of the Sheppard Subway through his ward and for opposing city funding to Pride while allowing Queers Against Israeli Apartheid to march in the annual parade. Maria Augimeri, who represented Ward 9, was first elected to North York City Council in 1985 and has since served on the old Metropolitan Toronto council until amalgamation in 1998. Since then, she has represented the Downsview neighbourhood on City of Toronto Council. She was nearly defeated in the 2010 election by conservative Gus Cusimano, but won with a comfortable margin in 2014. Augimeri is a New Democrat; she ran for the provincial NDP in 1987, and she has a progressive voting record on Toronto City Council. Augimeri sought re-election in Ward 9 under the 47-ward model, but found herself against a high-profile challenger, Louise Russo. Russo was the unintended victim of an organized crime-related shooting in 2004 and has since become an anti-violence advocate. She was Mayor John Tory’s special guest at the inaugural council meeting in 2014 just after he was elected mayor. Meanwhile Pasternak sought re-election in Ward 10, whose boundaries were identical under the new ward structure. His highest-profile opponent was Edward Zaretsky, an 84-year old resident who’s notable for parking his minivan in front of a pothole in protest earlier in 2018. Zaretsky has been an outspoken critic of Pasternak. 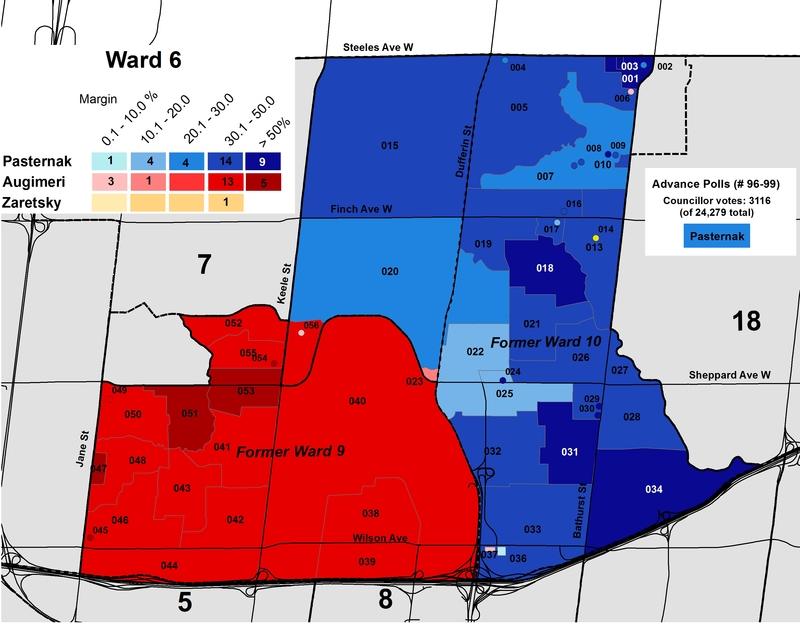 When Bill 5 came into effect after a failed court challenge, old Wards 9 and 10 were combined in Ward 6. A small section of old Ward 9 near Jane Street and Sheppard Avenue moved to Ward 7, while the area north of Sheppard Avenue between Keele and Dufferin Streets was added from old Ward 8. In the end, James Pasternak won the local council race with 47.6 percent of the vote compared to Maria Augimeri’s 38.0 percent. Louise Russo got 11.2 percent (but did not place first in any polls), while Edward Zaretsky got just 3.2 percent, but placed first in Poll 14, a seniors residence. The map above shows the polarized electorate in Ward 6. Augimeri placed first in all 19 polls located in former Ward 9, while Pasternak placed first in all but three of the 34 polls in old Ward 10. In the 19 polls located in old Ward 9, Augimeri got 61.5 percent of the vote, while Pasternak got 18.6 percent and Russo got 18.3 percent. Meanwhile in old Ward 10, Pasternak took 64.3 percent of the vote, followed by Augimeri with 24.4 percent and Russo with 7.3 percent. Russo likely cut into Augimeri’s support at the polls, but her candidacy was largely squeezed out in a two-incumbent race. What ensured Pasternak’s win most of all was simply an imbalance of population: there were more voters (12,340 election-day votes) in old Ward 10 than in old Ward 9 (8156 election-day votes). Because of the diverse demographics and geographic configuration of Ward 6, it might be attractive to high-profile candidates looking to run for council in 2022. Who knows what might happen in four years? This entry was posted in Election, Maps, Politics, Toronto and tagged 2018 Election, City Hall, James Pasternak, North York, Ward 6. Bookmark the permalink. While Augimeri would have been much preferable imo to Pasternak, the silver lining is that a fresh progressive voice could come around four years from now. I had no idea Augimermi had been in office for 33 years!